One of the three yellow chanterelles I found on our hike today up Mary's Peak just outside of Corvallis. My trip foraging for wild mushroomsin October has been one of the more memorable experiences I’ve had thus far in Oregon. So it’s no surprise my parents have gone ga-ga for the state’s champion champignons during their visit here. Dad has worked his magic in our Corvallis kitchen, whipping up a spectacular Cream of Wild Mushroom Soup and a chanterelle pasta (made with local spinach fettuccine). Can’t wait to see what he’ll do with the three chanterelles I stumbled upon while hiking Mary’s Peak today. Now the ‘rents are scheming up ways to smuggle mushrooms back to Virginia with them. Those precious chanterelles, for example, go for as low as $9 a pound here but can fetch as much as $20 to $30 a pound back East. And that’s only on the rare occasions when fresh ones are even available. Ah, a good reminder that life is good here in the fertile (and did I say wet!) Pacific Northwest. 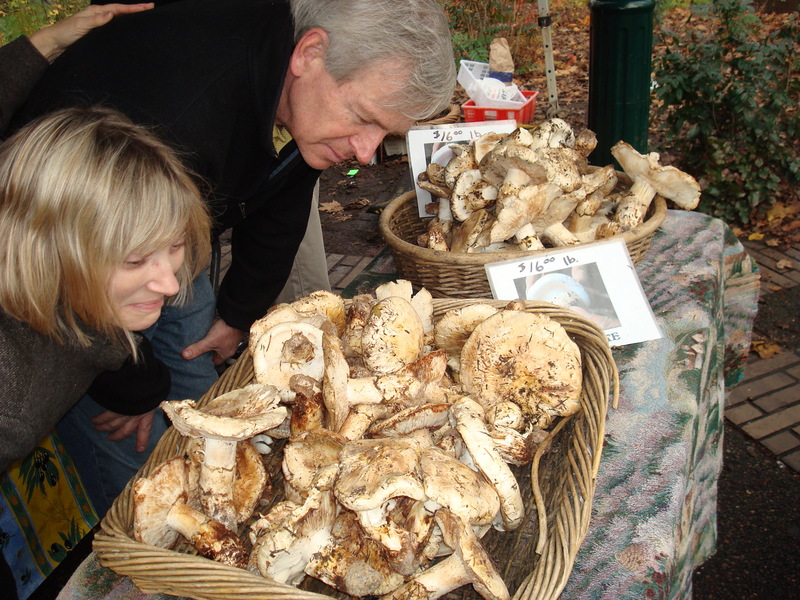 Look But Don't Touch: Mom and Dad marvel over abundant but expensive matsutake mushrooms at the Saturday Farmers' Market in Portland. I’m so looking forward to experiencing an authentic Oregon Farmer’s market with all that wonderful produce. Not as sure about the clothing-optional thing, though…. We’ve had a great trip out here- L &D have been terrific hosts, and all the local goodies and activities have been wonderful. 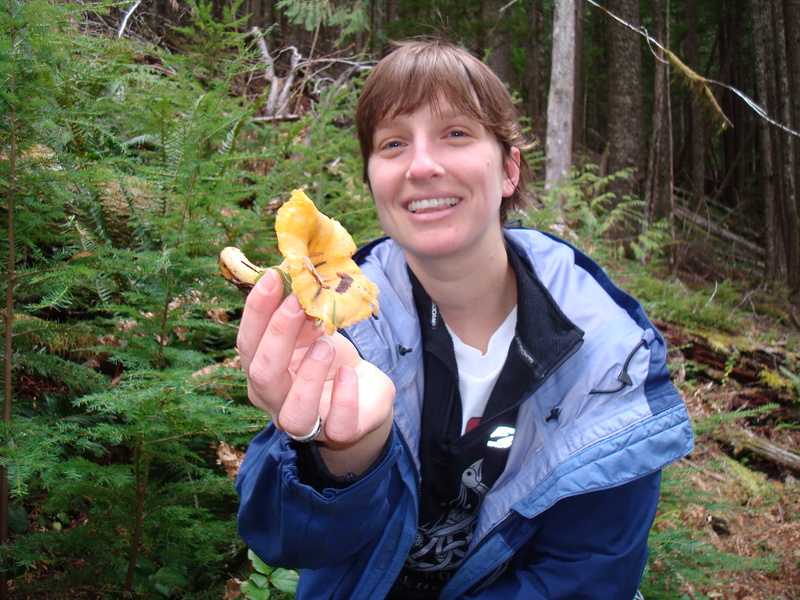 The Mary’s Peak hike is so serene and remote, old growth forest, ferns, mushrooms galore, but we were only willing to chance the easily recognizable chanterelles- Laura knows their habitat and sniffed them out. M-i-l and d-i-l will love the trip out, and the clothing optional is at the springs only- sheltered and more private than it may seem from the photo- a surprisingly enjoyable place to visit. The farmers markets may be closed for the winter- the local one is now, but that’s good incentive to return! You look so much like your mom! Wow!